Unlike previous shows, there was structure: it was going to be the songs from Hot Rocks and they were going to be performed in order, which I do not understand; it’s not like this was Exile On Main Street where track sequencing would actually matter. Sometimes structure is liberating; other times it is just, well, restricting. Unfortunately it was the latter tonight. THE VERY GOOD: Ronnie Spector handled “Time Is On My Side” well. 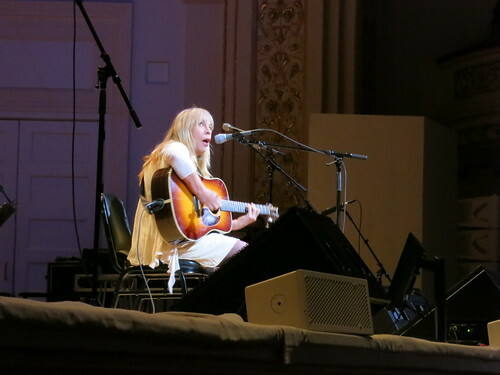 Marianne Faithful with “As Tears Go By.” A little disappointed that David Johansen, a clear favorite, didn’t bring more to “Get Off Of My Cloud.” Taj Mahal brought along a tremendous female vocalist to accompany him on “Honky Tonk Women,” which brought up the energy in the room. THE EXCELLENT: Peaches played “Heart of Stone” fairly straight, with more than a little Janis Joplin, I thought. Steve Earle rocked out “Mother’s Little Helper” commendably. 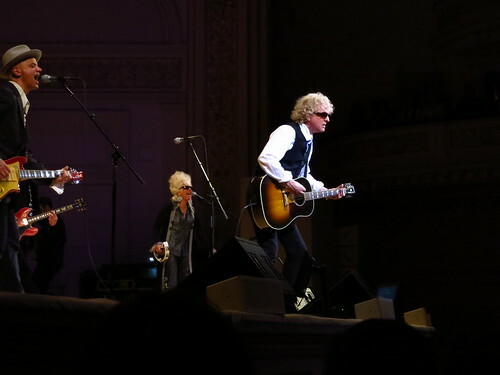 Ian Hunter absolutely brought it for “19th Nervous Breakdown,” surprising even me (and I’m a fan). 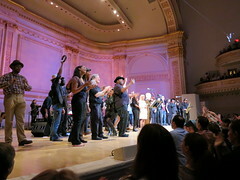 Ian was one of the only performers to note that he was at Carnegie Hall, that he had seen Frank Sinatra here, and that Sinatra had stood where he was standing now. A little bit of nerves can be a good thing, I think. The Mountain Goats were excited and enthused but still struck the right tone for a stripped down “Paint It Black” on piano and drums; I hate to say something like “they practiced and it showed” but I always have respect for someone who cared about doing a good job. Gomez performed an exceedingly brave arrangement of “Jumping Jack Flash” that slowed it down and sped it up and then ended it on a Ramones-worthy pace; initially you weren’t sure this was a good idea but by the second verse you could feel people’s attention creeping back and they got a big hand at the end. Angelique Kidjo tore up “Street Fighting Man” and was one of the better matches between artist and material in that stretch of the show. Rickie Lee Jones and “Sympathy For The Devil” could have been a huge trainwreck but the performance was flawless and it actually worked, the people around me who suddenly got all chatty because it was relatively quiet shut up by the second verse, and the fans up in the cheap seats were adding faint “woo-woo”‘s in the appropriate places at the end. At first it seemed to throw her off, but by the end she was doing it herself, working it into her arrangement. Finally, I loved Rosanne Cash’s “Gimme Shelter”; it was warm and not as angry or fierce but it was loud and strong and absolutely valid. Last but not least: the house band, which was basically Patti Smith’s band, led by the inestimable Lenny Kaye, plus a keyboardist I did not recognized. This was an inspired choice, because these guys actually played in cover bands and could follow the artists as they made their way and sometimes struggled through the material. Only complaint is that sometimes they just weren’t loud enough. THE QUESTIONABLE: Glen Hansard is a tremendous talent but – “Under My Thumb”? One of these things is not like the other, said my brain when this pairing was announced. I appreciated his arrangement, with a stand-up bass and minimal guitar, but asking the auditorium to snap their fingers – I am sorry but this is not a crowd participation number in any way, shape or form. This was just a huge mismatch that didn’t work. The Carolina Chocolate Drops performing “Midnight Rambler” was something I was very interested in, but I feel like they didn’t take it far enough. They stripped the lyrics down and cut out most of them and I feel like this was largely a missed opportunity. 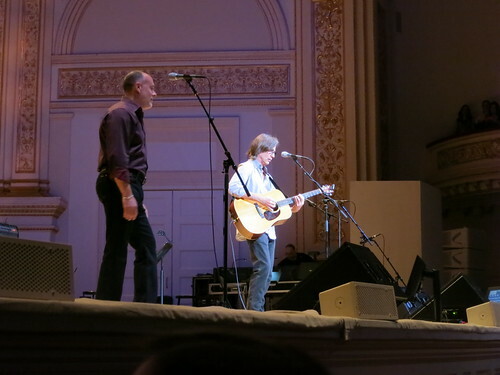 Jackson Browne and “Let’s Spend The Night Together,” acoustic; the crowd went nuts because it was Jackson Browne but this just left me flat. Even the idea of it would leave me flat. THE UNNECESSARY: Juliette Lewis saunters out in rhinestone high heels and glitter hot pants and attempts to sing “Satisfaction.” She meant well, I am sure, but she cannot sing, and she has no rock and roll stage presence. 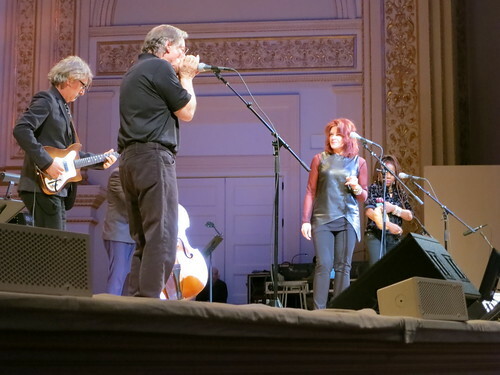 She shouted, she ran around, she over-sang, and the audience, being old white men of a particular age, ate up the fact that she has awesome legs and is cute. I have no quibble with her acting but she does not belong onstage performing rock and roll. I cannot believe there was no qualified musician available to perform this particular number. THE UNINSPIRED: Oh, I just don’t know where to start here. “Brown Sugar” by Jackie Green (straightforward and unmemorable), “Play With Fire” by Rich Robinson (missing emotional timbre entirely), and the worst offender, “Ruby Tuesday” by Art Garfunkel, which just completely emasculated the song and turned it into an AOR arrangement. The show’s ending was unfortunate. Marianne Faithful was brought back out to perform “Sister Morphine” and while most Stones fans actually give a damn, this was the equivalent of letting the air out of the balloon for most of the people who were there, because it was the cue that there were no actual Rolling Stones in the building. I don’t think this was fair to Marianne and it wasn’t the best note to end the show on; c’mon, it was SISTER MORPHINE for heaven’s sake, the song she wrote about overdosing, that she had to fight with the Stones about to get her fair share of royalties – this is not how you want to end this night that’s supposed to be celebrating 50 years of the Rolling Stones making music, or all the people who just donated money to help keep music programs in schools. And, please, for the love of all that is good and holy, either rehearse the finale jam number with all participants, or drop it. This is the third time I’ve had to watch people walk out with lyric sheets and mill around the stage and kill any energy that was left in the room because they didn’t know the words or the song. “Tumbling Dice” is quite possibly the Stones’ worst live number–even back in the day, through the magic of bootlegs, it went on and on and on and has none of the energy of the original. As an encore number that only a few musicians were actually interested in, it just stopped things cold, especially once people were fleeing the auditorium during “Sister Morphine” (and may I add, shame on you). It’s a great cause and a great concept and as long as I’m interested in the artist who is the subject of the tribute, I’ll definitely be coming back.